As we were driving up Highway 1 on our way to the Monterey Bay area, we saw signs for Hearst Castle and were kicking ourselves for almost forgetting about it. We had always wanted to see the castle, but for some reason, we had thought it was further up north near San Francisco. 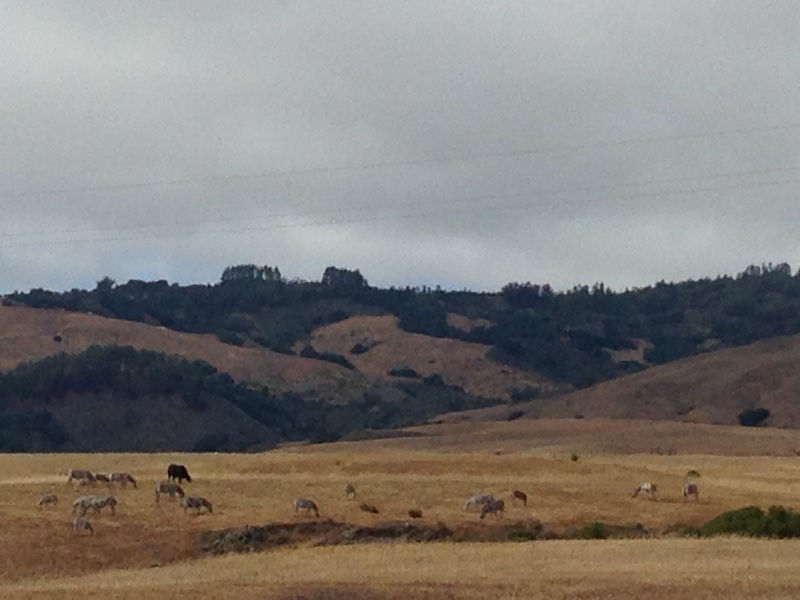 It turns out though that it’s between Santa Barbara and Monterey Bay in San Simeon. We didn’t want to miss it, so we decided to make the drive back down Highway 1 to the castle, which would also allow us to get a better look at the coast. When we initially drove up the coast, we were so nervous with towing the trailer on the narrow road, that we weren’t able to appreciate the beauty of the area. We were so glad we went back with just the truck the second time around so we could actually focus on the stunning coastline. Plus, there are significantly more turn-outs on the southbound side of the highway to pull over and get a better look at the view. The drive down to Hearst Castle took several hours, but it was worth it! The coastline along Highway 1 really is as gorgeous as everyone says. 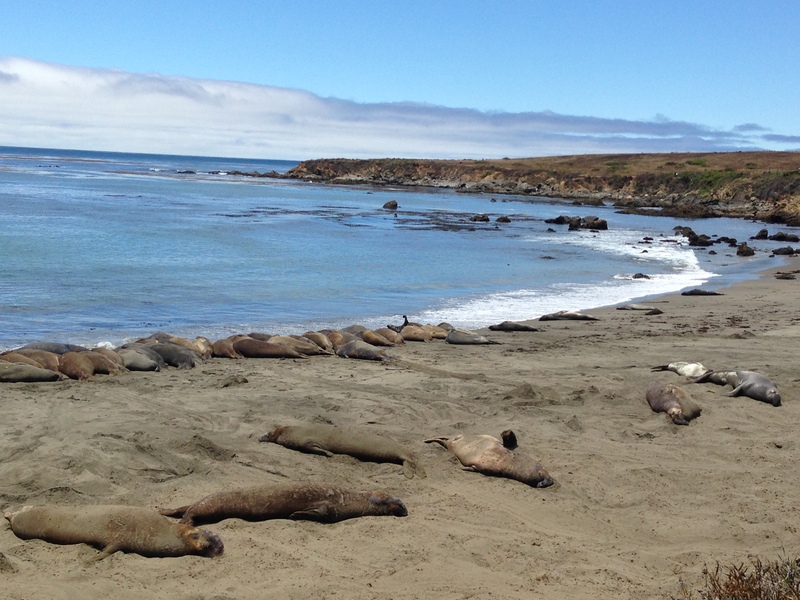 And aside from the ocean, the scenic cliffs of the coast and the interesting bridges along the way, we also saw a group of Elephant Seals at a viewing area about 4 miles from the castle! We thought we had given ourselves plenty of time to get to Hearst Castle before our tour, but we got there just in time! There’s so much to see along the way while driving down the coast, that it can turn into an all-day trip. We parked at the visitor center and then caught a bus, which drove us up about 5 miles to the top of the hill where the castle is located. We really enjoyed the Grand Rooms tour of the elaborately detailed castle. As we were walking through the rooms and looking at all the ornate artwork and artifacts Hearst had collected from Europe to use in his home, I decided that some people have too much money. Haha! On the way back to where we were staying outside of Monterey Bay, we took a different route up the 101 and drove through countless vineyards in wine country outside of Paso Robles. We ended up having lunch at the harbor and then continued up north. The drive took us through San Francisco over the Golden Gate Bridge. This was another nerve-wracking drive! The streets through San Francisco are quite narrow to be towing a trailer through. And even though the Golden Gate Bridge has a wider lane for RV’s, it was still tighter than we would have liked. We made it though! But then we got stuck in horrible traffic on the 101. Traffic in California? Go figure. Haha! We’re ready to be out of California, but it’s such a long state, it seems like it goes on forever. We left our last campsite in Central California at 10am and didn’t reach our next campground in Northern California until 8pm. We’ve decided to try to break up our drives more and not do such long stretches at a time. I love Big Sur, but I couldn’t image driving Hwy 1 with a huge trailer. I’m glad you took the time to go back and enjoy the views and see Hearst Castle. It was definitely a little treacherous with a trailer in tow. So worth it to go back without the trailer!